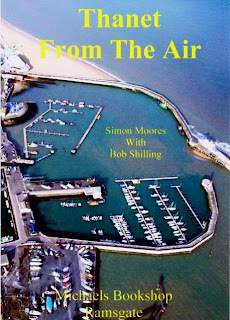 I'm reminded that you can now buy "Thanet from the Air", a collection of aerial photos of the island from Michael's Bookshop as an online purchase. I hope to update it one day soon, with close to 1,000 photographs now in the archive but at £5.99 it's not a bad little coffee table book. I need to go over and update the photographs of the Sea Bathing site, the Marlowe Academy and others soon. Simon, any thoughts on the use of R/C blimps and Helekites for aerial site surveys? I am working on setting up a business to let out such a service for photos from a maximum of 300'. Blimps also good for advertising. Blimps I'm sure are fine but be aware of Manston next door and potential limitations on height. The other sounds like a good idea but I wonder if the quality and control of the photos would be as good as those from an aircraft platform? Thanks Simon. Had an interesting chat with the guy who developed the latter which offers lots of lift and has been trialled by the forces. Credit where its due, he didn't try selling me a top model and said the basic would be suitable. Basically send the kite up with the camera and shoot off 1000 photos and pick the ones that do the job and if none do, send it up again. Not very scientific but cheap and he was honest! I like the blimps (Minizepp is one) but even a 20 footer which is what I need to lift cams needs a small ground crew of two guys to catch hold of it and operate a radio downlink, however that aside there is serious advertising potential which would look good bobbing along the coast. I know about the airport issues so don't worry about coming face to face with a Graf Zeppelin as you come into land! I'm away from there! I'm still in the planning stage and am considering sponsorship. I used to love seeing the Goodyear airship come in at Manston. Years a go I worked there and one night the groundcrew came back from the pub quite merry and a bit noisey and woke up the airport firemen. Imagine the language! Ed,thought you might be interested, I got a photo of the old thanet way taken by the nazis when they were mapping the coastline when they were planning to invade us. I did have the original plate but I gave it to the manston history club. I got David in henrys to to develop the photo from the glass plate. I also did a copy for the margate museum archive. The good thing is that Herman Georing PLC is defunt so there is no copyright. Wonderful.. can I have a copy? No problem, I will give you my mastercopy. I can easily copy the one from the margate museum should I need it. I don't know what your german is like but on the bottom it reads " Befestigte Ortshaft und Befestigte Kreuzung neuer Straben sudwestl Margate"
The picture was in the gazette on 20th May 1997 and I have some history about it from John Williams. I did have another 13 glass slides but I gave them to the Manston History Club. How do you want the photo and details delivered. I will be out canvasing with Iris Johnston tommorrow over garlinge way so I could post them through your letter box if you give me your address. Very kind of you Tony. Send me an email to simon_moores at hotmail.com and I will give you the address. Either that or you can scan the photo and send me the JPEG file! That funny symbol that looks like a B is in fact an esszett or double s.
All of this reminds me of a letter in the Gazunder of a couple of years ago from a retd Wing commander RAF. he suggested that J Godden Esq should be awarded the Iron Cross as more empty spaces seemed to have been created by him in Thanet than all the efforts of the Luftwaffe. What memorial could we put in Godden's Gap?